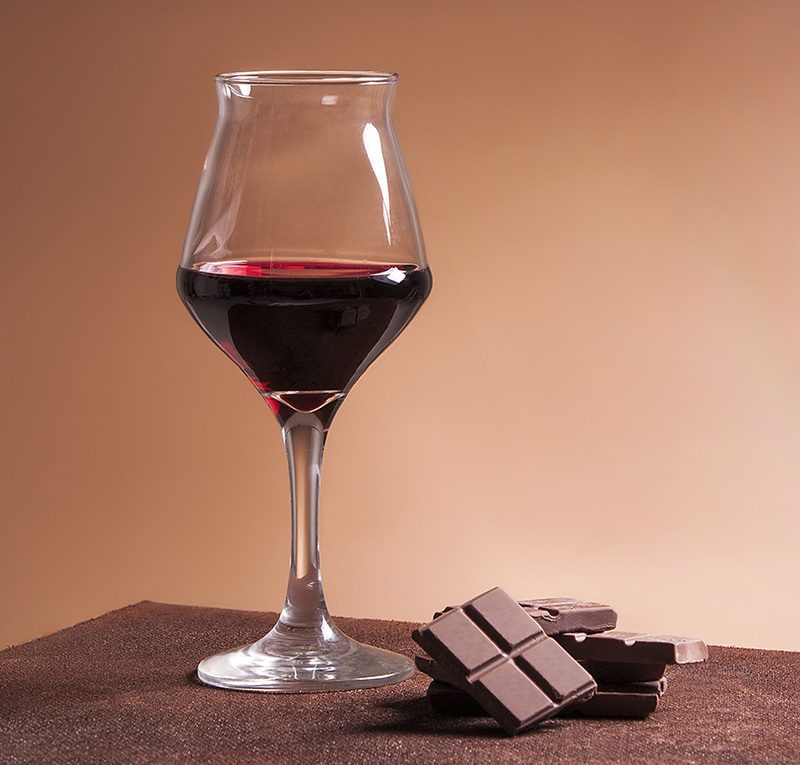 Wine and chocolate can be a match made in heaven when they are right for each other. When dark chocolate is paired with red wine, it is taste-bud nirvana. The rich, creamy cocoa flavors are intensified by the wine, and tannins in the wine are smoothed by the velvety texture of the chocolate. Finding the right wine for your valentine can be complicated but trying to figure out the percentage of cocoa you need in your chocolate to make a perfect union is even harder. The first rule of thumb is choose dark chocolate, which is healthier than milk chocolate and a potent antioxidant. Dark chocolate also contains heart-healthy and mood-enhancing phytochemicals, much like red wine does. Couple the two together and it can be bliss. But, like any great marriage, only one partner can be in charge at any given time. If you have a milder chocolate, such as one with 72 percent cocoa, you don’t want to pair it with a complex, sturdy wine. The wine can completely overpower the chocolate and make it taste bitter. My favorite everyday pairing is a 70 percent cocoa dark chocolate with a lighter pinot noir. Special occasions, like Valentine’s Day, call for Amarone, an Italian wine from the Veneto region. This underappreciated wine (probably because of its cost) has notes of raisins, cherries, and a touch of spice. Paired with a rich, bittersweet chocolate, it’s a luxurious finish to any meal. An 85 percent cocoa dark chocolate is best for bold wines with sturdy structures. The intense chocolate by itself is not one that most people are passionate about when they bite into it; however, the intensity of the cocoa is softened by a complex syrah or cabernet, and many wine connoisseurs think this is the perfect pairing. The wine enhances the chocolate and vice versa. As in most matters of the heart, no one can predict with certainty which combinations work. From my informal poll of fellow members of the International Food, Wine & Travel Writers Association, I learned that love has no boundaries when it comes to chocolate and wine. Much like wine tastes, favorite pairings ranged from excessively sweet to bone dry. Some folks fell madly in love with sweet dark chocolates, such as Dove or Hershey’s, paired with Chianti. And forget all that talk about heart-healthy antioxidants, because a few people refused to forsake their milk chocolates when paired with sparkling wines. One association member noted an exotic pairing of ginger-flavored chocolate paired with a chardonnay. Just like a dream date, the slight heat from the crystallized ginger and the sweetness of the wine created a memory that has lasted years. Others say Malbec paired with a salty dark chocolate works for them; another recommended a toffee-flavored chocolate paired with a hearty zinfandel. Chocolate with bits of tart cherries was the perfect mate for a merlot, said another wine writer. No matter which pairing you choose, a luxuriously rich chocolate melting in your mouth chased by a sip of fine wine is an indulgence that will make your day of romance memorable—with or without Cupid.